With the former night stand moved and just a tiny sliver of space on each side of the bed, I had to get a little creative. I had another bar stool that was not only free to me, but fit perfectly between the bed and the wall. 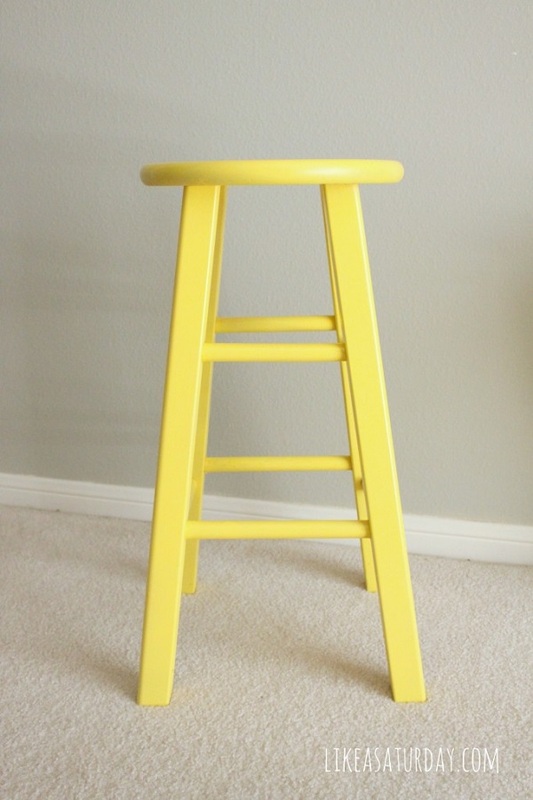 To start, I gave the stool a couple of coats of yellow spray paint. I wanted a fun, bright color that would pop against the blue-green walls. Is that not the happiest, cheeriest color you’ve ever seen? While this bar stool turned table was already wonderful as is, I still wanted to be even more functional. Enter: sisal. Sisal may be one of the most useful tools out there. I created shelves by hot glueing and wrapping the rope tightly around the rungs of the stool. While wrapping the rope, I would stop periodically to add a dab of glue. I made sure it was all very tight and secure so that it wouldn’t budge. I’m really happy with how it turned out! I love the great texture and warmth that the sisal brings to the space. Those shelves are perfect for keeping a couple of books, or setting your phone and watch at night. With the rearranged furniture and a couple of fun touches, the guest room is feeling much more welcoming…and I feel much happier walking past this room and seeing cheery colors instead the side of a big dresser. All this room needs is a set of drapes, and a couple updates to the existing furniture and we’re all set! Source: This article was first published on likeasaturday.com, but since that website is no longer available we have republished this article to save this wonderful tutorial.